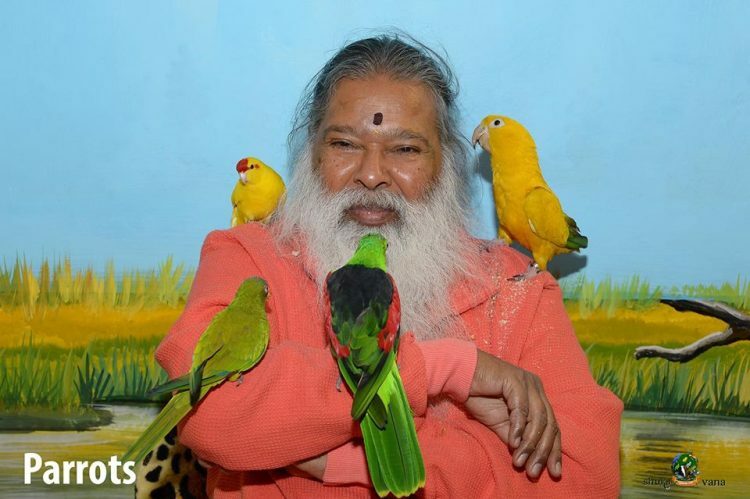 Dr. Sri Ganapathy Sachchidananda Swamiji has recently been recognized by Guinness Book of Records for housing the most bird species under a single roof, 468. He is not a collector who takes pleasure in depriving exotic birds of their freedom, but simply a compassionate man who rescues endangered, injured and abandoned birds from around the world and offers sanctuary in his aviary. 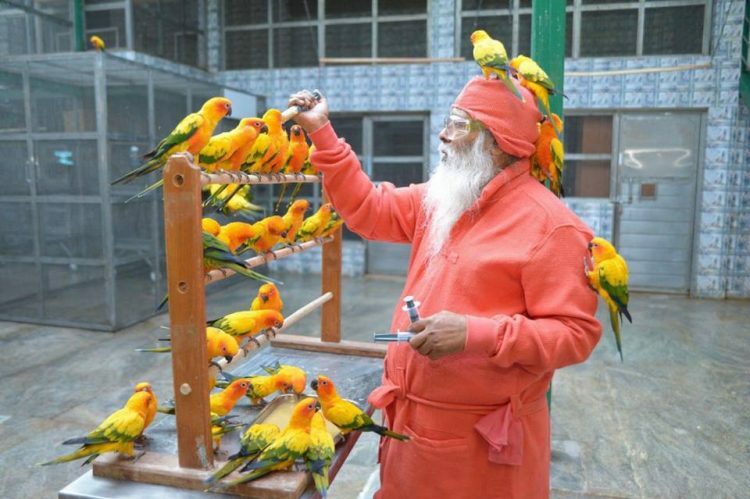 Swamiji, the founder of Avadhoota Datta Peetham ashram, in Mysuru, India, has been passionate about birds for as long as he can remember. Growing up in Mekedattu woods, on the shores of the Cauvery river, he remembers spending much of his time watching many species of birds as they took shelter in the trees outside his house. But it was an accident in 2011 that made him understand his purpose in life – to save as many endangered and abandoned birds as possible – and build his 21-acre aviary in the forests of Mysuru. 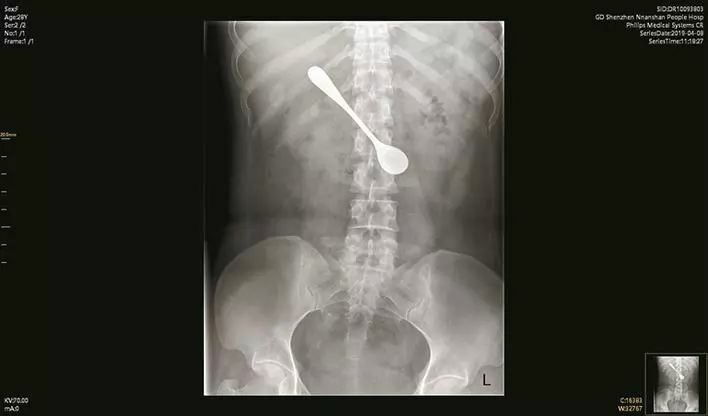 Six years ago, the Hindu Swami was visiting Angel Falls, in Venezuela, when he lost his footing and took a 100-foot fall, losing consciousness. 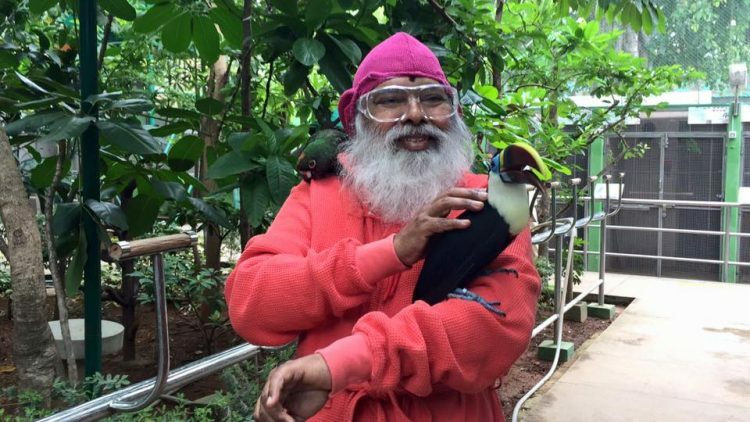 As he woke up, Sri Swamiji found himself surrounded by hundreds of Amazonian birds, and claims that as he admired their beauty, he had an epiphany about building a rehabilitation center for injured and endangered birds. 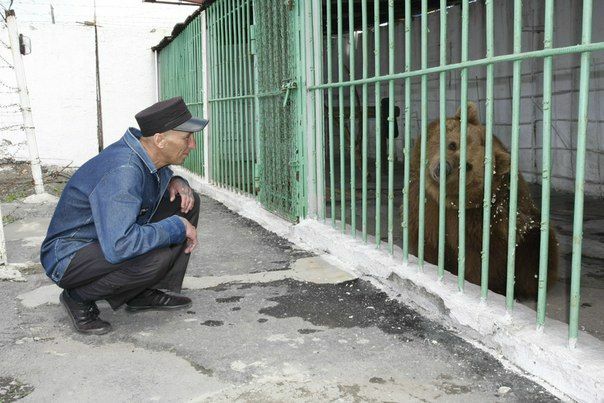 As soon as he returned to India, he made plans for an aviary on the grounds of his ashram, complete with a veterinary hospital, rehabilitation center and dozens of individual bird rooms. 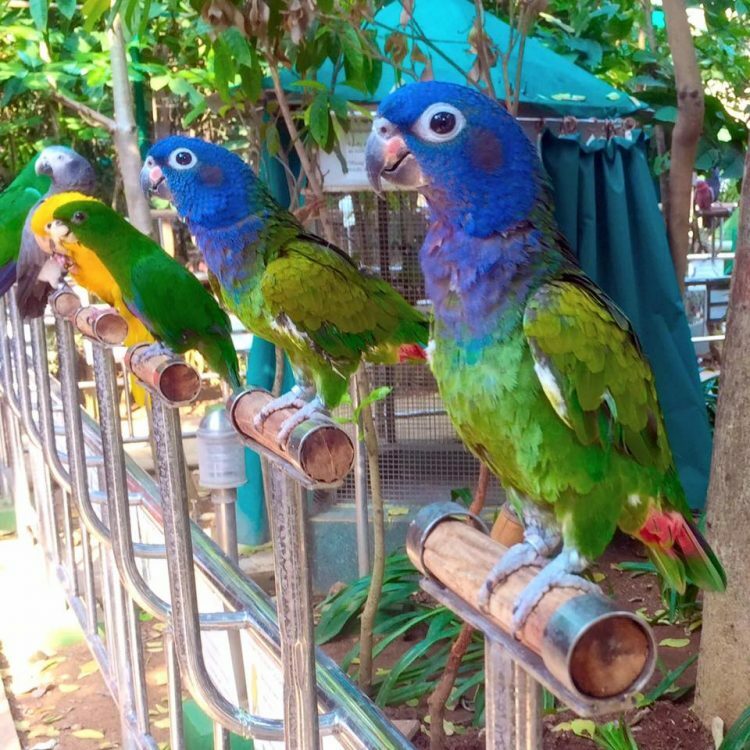 Designed with technical assistance from Singapore’s Jurong Bird Park, the Shuka Vana aviary opened in 2012, and quickly became a hot spot for bird experts and enthusiasts. Today, Shuka Vana is home to over 1,500 birds from 468 bird species from all around the globe. Among them, are vibrantly colored parrots, macaws, and cockatoos, caiques, lorikeets and African lovebirds. 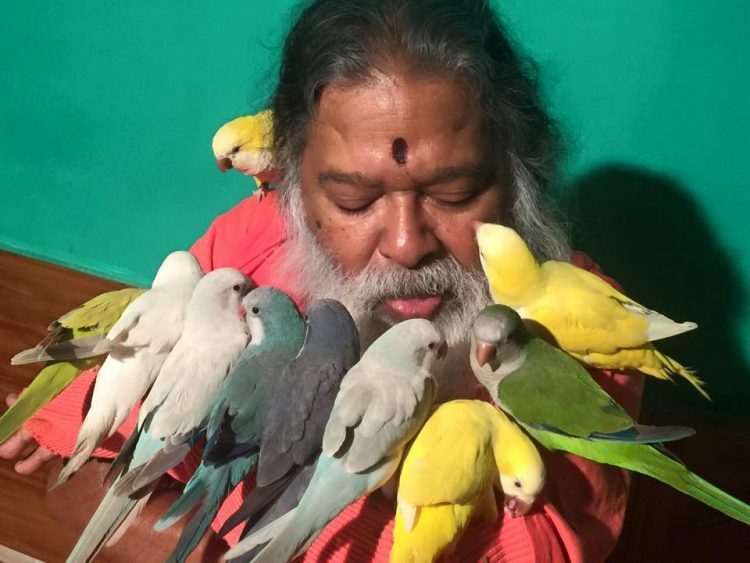 Dr. Sri Ganapathy Sachchidananda Swamiji and a staff of over 50 people devote most of their time to the birds, feeding them, treating injuries and even training the birds to better interact with human visitors. But apart from endangered bird species, Shka Vana is also a haven for abandoned and injured birds, nursing them back to health, or simply offering them a home if their owners no longer want them. 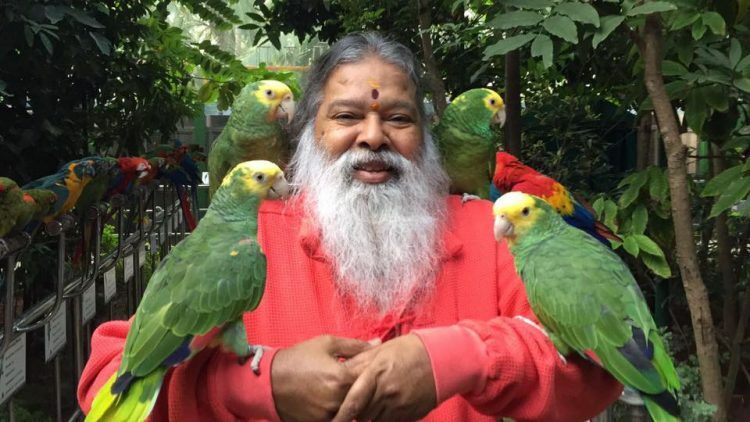 Sri Swamiji believes that birds are vital to human existence and often appeals for the halting of deforestation and a better treatment of birds. This amazing story reminds me of another Indian man dedicated to the welfare of birds – the Birdman of Chennai. The 63-year-old feeds over 4,000 parakeets, on the roof of his home, every single day.